Phoenix Copier Sales can save your business time and money. Buying a new copier can also help your business be more greenand environmentally conscious as well. You’ll use less ink, less energy and generate less waste on copy jobs. The money you save on energy means you can afford to hire more people or expand services and products to new areas. Phoenix Copier Sales stocks a variety of Konica Minolta and Sharp copiers which fit any size office space. If you have a small business operation or a large company with multiple locations, can help you outfit your business with affordable options. Contact our customer service representatives for the fastest, most reliable copier company in Phoenix. Highlight key features on work plans, edit documents or mark-up hard copies of documents and fax or email them quickly to others working on the project team. Don’t sacrifice high resolution when converting documents to PDF and emailing them to clients. If you are trying to find an established copier sales in Phoenix, we have the expertise and knowledge your business needs to succeed. Our copiers also make it easy to electronically archive, share and retrieve documents. The newest copier features can improve communication between different office locations or allow you to send files to clients and customers directly from a machine. This saves your business time and money. Phoenix Copier Sales is ready to impress you and your clients. 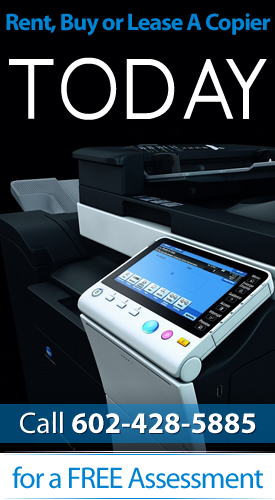 Having the right copy machine for your business can save you design, layout and printing costs. Our copy machines save you staff time and printing costs with unmatched copier sales in Phoenix. Your business can also save document distribution and advertising costs with all-in-one copy, fax and scanning features. Save printing and paper costs with touch-screen email and electronic distribution of brochures, flyers and sales sheets. Quickly email or fax important business documents to meet tight deadlines and save mailing costs.